This post is really an opening for new comers. Where do I start? What do I need? I can’t draw, it’s too expensive. Let me stop you. The previous post discusses .‘The First Hurdle’ . There really is something for everyone and everyone’s budget. While you’re wondering what type of art is going to get your creative juices flowing and what materials you’ll want to eventually invest in, gather together some basics. Seriously, don’t rule anything out just yet. If you have children, you may be surprised at the resources and materials already at your finger tips to begin. 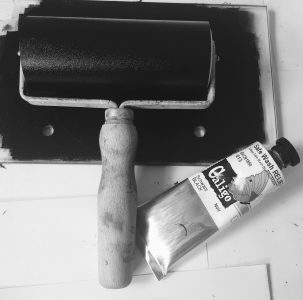 Keep that old box (if you’re about to have a clear out) for printmaking or storing your materials. Get creative by thinking about alternative uses for those recycling materials too. Now, write down the things you are passionate about or at least like: how will you relate this to your art? Do you have any physical limitations that may affect the tools you use? How much space is available for your art? These are just a few questions to help focus your direction. Still having doubts that you can indeed do this? Just to put this into perspective, some of my work has involved creating art with young people who have severe physical limitations so I can honestly say, ‘art is for everyone’ and that includes you. Have a great day while giving time to thinking about the things you’re passionate about.